I’m excited for today’s post because it’s about Halloween! Every year I wait til the last minute to get a costume and end up spending like $50 on a costume that I will never wear again. After a while that gets old! Since I’m moving soon, I’m all about saving every penny I can so I decided to challenge myself and use my closet. I can say that I am so happy with the results!!! 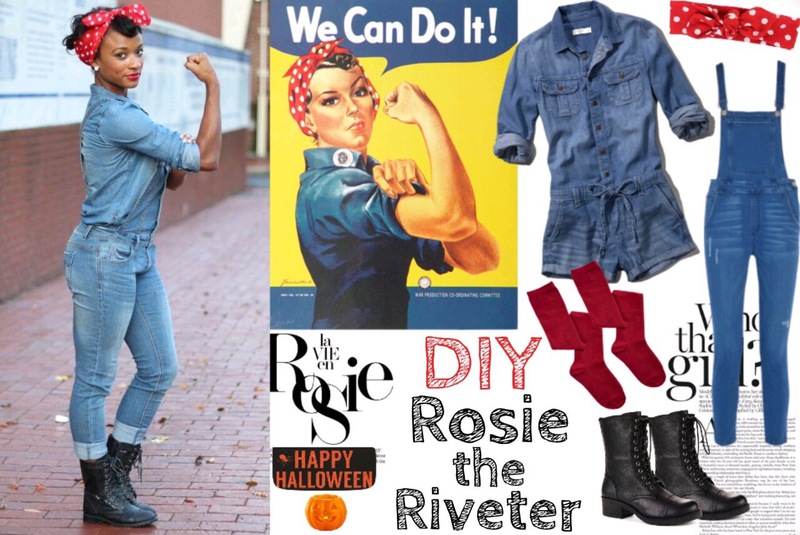 Rosie the Riveter is so iconic and she stands for the ultimate independent woman. The outfit is super easy to recreate. I paired my denim shirt with my denim romper to give the full long sleeve jumpsuit look since I don’t have a jumpsuit with long sleeves. Then I did some research on what Rosie actually wore. I had some options in mind but not enough time to get all the materials (sorry y’all). The other materials included a silver lunchbox and the sign with the slogan “We Can Do It.” She wore black combat boots with red socks (I’m not wearing the socks since you wouldn’t be able to see them). To top the look off, I already had this polka dot headband/scarf so I knew this would be the perfect costume for me. You can do it to!